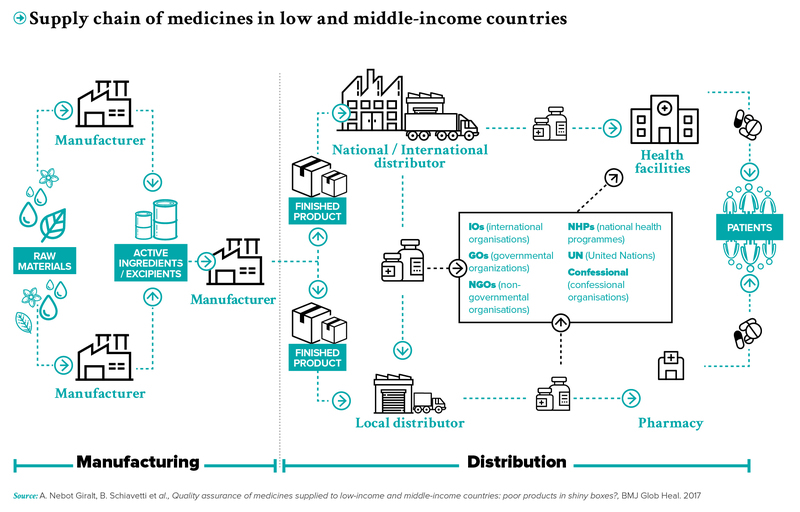 Pharmaceutical production grew globally over the last decades: active ingredients and finished products are manufactured across different regions, and circulate through multiple distribution channels. Sadly, globalisation of production was not accompanied by strengthening of the regulatory systems worldwide: many national medicines regulatory authorities (NMRAs), especially in sub-Saharan Africa, are under-resourced and struggle to control their markets. This article is co-authored by Raffaella Ravinetto, Daniel Vandenbergh and Corinne Pouget. It is largely based on a paper previously published in the Journal of Pharmaceutical Policy practice: Ravinetto R, Vandenbergh D, Macé C et al. Fighting poor-quality medicines in low- and middle-income countries: the importance of advocacy and pedagogy. J Pharm Policy Pract 2016; 9:36. Poor-quality medicines include falsifications, which are “deliberately or fraudulently misrepresented with regards to their identity, composition or source”, and substandards, which are “authorised by the NMRA but fail to meet national and/or international standards”, due to poor manufacturing and quality control practices that are not detected by regulators.2 Both falsifications and substandards cause therapeutic failure, toxicity and resistance, leading to human suffering, loss of faith in health systems and resources’ waste. But causes and corrective measures are different. Falsifications result from a deliberate willingness to fraud, and they must be fought by repressing illegal manufacturing and distribution. Conversely, substandards result from human error or negligence at manufacturing sites, or from degradation due to poor storage and transport conditions; thus, prevention and elimination require a complex set of measures, i.e. strengthening the capacity of NMRAs, of manufacturers and distributors, and promoting ethical behaviour of all stakeholders. At African level, a Medicines Regulatory Harmonisation Initiative was started in 2009 under the New Partnership for Africa’s Development (NEPAD); and the launch of the African Medicines Agency (AMA) is expected in 2018, to ensure that all Africans have access to affordable medical products that meet adequate standards. It is hoped that AMA will establish an enabling environment for the development of the pharmaceutical industry, since upscaling access to quality-assured medicines requires both a functioning regulatory framework, and a local pharmaceutical sector able to work according to international standards. During recent years QUAMED 5, a network of non-governmental organisations and local procurement centres, has developed an innovative approach to improve the quality of medicines in sub-Saharan Africa. QUAMED members pool resources for auditing distributors and manufacturers according to the WHO standards, in order to orient purchase practices toward quality-assured suppliers. QUAMED also increases the knowledge and quality assurance skills of partner organisations through specific training, sharing of information and support. In the future, it hopes to further develop its auditing capacity, in order to build a more direct interaction with manufactures willing to invest on public health needs in Africa. Awareness of poor-quality medicines remains quite low among non-specialists, i.e. academics, policy makers and actors involved in the supply chain, at least partly because pharmaceutical issues are insufficiently addressed in the study curricula. Thus, more and better advocacy is needed for universal access to quality-assured medicines, targeting regulators, manufacturers and suppliers, international organisations, journalists, purchasers, prescribers, program managers, policy makers, public health actors and patients. Adequate communication tools, in lay language, are needed to address non-specialists that may play a role in defining policies and/or in advocating for universal access to quality-assured medicines. QUAMED, for instance, increasingly builds on collaboration with academic institutions, scientific and public health platforms and policy makers, to contribute to documenting the extent of the problem, and to feed advocacy for universal access to quality-assured medicines 6. Many manufacturers in sub-Saharan Africa would benefit from technical assistance and technology transfer for upgrading to the WHO standards. It is important for the private sector to be able to engage in such collaborative partnerships, for example through public-private partnerships, and as part of corporate social responsibility policy. Some essential medicines do not currently exist in WHO PQ formulations, e.g. : benzathine penicillin, for mother-to-child transmission prevention of syphilis. The European private sector should be able to invest in these products, either directly or through a local company in sub-Saharan Africa, and through equitable pricing policies. Specific initiatives may support countries and/or their regulatory authorities to set up sustainable programs in areas that are currently lagging behind, such as Merck for Mothers (for strengthening the supply chain) 8; and/or to carry out R&D programs for neglected tropical diseases 9. The private sector plays a key role in setting the price of pharmaceuticals. High prices in poor countries often hampers affordability and push desperate patient toward non-secured supply chains. Ad hoc mechanisms could be envisaged to systematically improve the affordability of innovator essential medicines in such contexts, such as differential (equity) pricing, or the model of the Patent Pool 10.